I need to acknowledge the inspiration, assistance, and support of a number of people. Without them I would never have completed this project. The first, of course, is Dr. Halton Arp himself. It was his dedication which led to publication of the catalog, inspiring a generation of astronomers, both amateur and professional. You are probably well aware that his treatment by, and acceptance within, the U.S. professional astronomical community has not been good for many years. His ideas, while never in the mainstream, have been much better received outside the U.S. and that is why he has lived and worked in Europe for many years. I can't say that I really subscribe to his major thesis, but he is a brilliant man who presents serious issues to be addressed, and they generally aren't. I would be surprised if his theories supplant the current cosmological model but I would be equally surprised if some of them don't get incorporated within it -- probably when proposed by some other more "acceptable" source. In addition to his brilliance, he is friendly, enthusiastic, and charming. Twice in ten years, he made the trek to West Texas to talk to 600+ amateurs and a few professionals at the Texas Star Party. When there, he was on the observing field at night, up ladders when required, sharing the eyepiece with many of us. I will never forget the afternoon he spent under the shade of a large oak, sharing wine, smoked oysters, and stinky cheese, telling hilarious tales of his own misadventures and those of other famous astronomers. 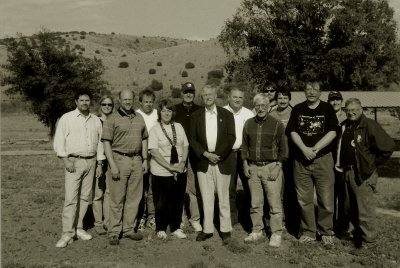 The picture was taken that afternoon by Jeff Rowe and includes, left to right, Jeff Kanipe, Alexandra Witze, Dave Tosteson, Scott Ewart, Barbara Wilson, Don Halter, Dr. Arp, Jack Petersen, me, Shane Ramotowski, Charlie McLeod, Dennis Webb, Becky Ramotowski, and Ken Lester. Without Dennis Webb's dedicated interest and research, the Arp catalog would likely have remained an esoteric repository of photographs known only, and used little, by professionals. Dennis opened it up to the amateur community and publicized its wonders. As already described on The Project page, it took quite a while before I shared Dennis' interest and I would never have had the perseverance to follow through alone. I like the challenge of completing observing lists and his role in getting the Astronomical League's Arp Observing Program established gave me another one to pursue. And finally, helping with his book kept me going well past the first 100 and got me close enough to the end to make the entire catalog seem reachable. My wife, Nancy, is not a astronomer but has been supportive throughout the effort. I made quite a few trips to our cabin and observatory by myself, both because of her schedule and the fact that it isn't much fun to be in a cabin in the woods where your husband stays up all night and sleeps all day. And on nights we were there for family events, she understood my need to slip out to the observatory to grab a few dark hours. There were many others who helped me along the way at various times. Al Kelly taught me most of what I know about image processing and joined me on a couple of observing trips to my cabin. Chuck Shaw was always a source of good ideas for improving equipment or observing techniques. Richard Berry and various collaborators (especially Jim Burnell) helped the whole imaging community by writing the CCD Cookbook, the Handbook of Astronomical Image Processing, and AIP4Windows. Emil Bonanno's Megastar charting program now contains the entire Arp list, and I really depended on it to plan the images, find the objects, and position the camera. I've undoubted forgotten someone who contributed greatly and for that I apologize. Like everything else on this site, I'll fix mistakes as quickly as I catch them.